Made with whole milk, this fresh cheese has a mild, clean flavor and creamy texture with just a hint of sweetness. 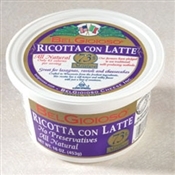 Ricotta con Latte 73 is made with less moisture for optimal performance in cooking lasagnas and raviolis. Ricotta Con Latte 75 is perfect for your baking needs. Profiled in Women's Day Magazine, BelGioioso Ricotta is a must for your cooking & baking! Ricotta must not be in transit for more than one day. Ground shipping is available for Wisconsin residents only.